I'm off work this week for some much needed down time. It's a great opportunity to get things organized for the start of our market season. I have spent time this week taking a full inventory of what I have available, what I need to make, what needs to be labeled and organizing my Square storefront. 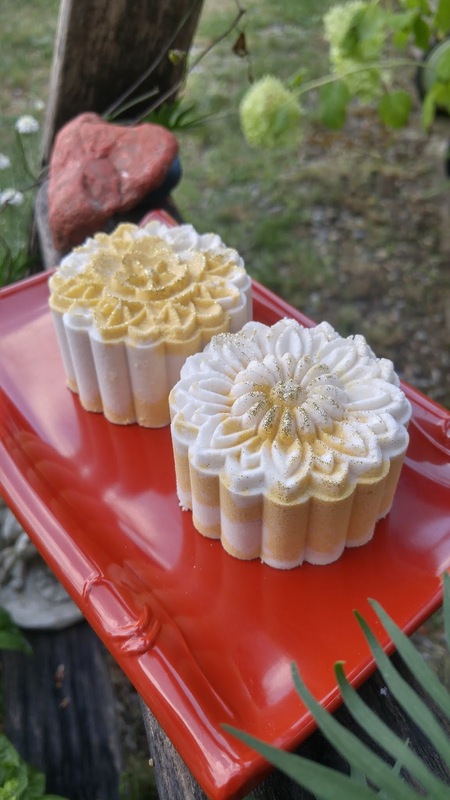 I've spent time making soap and planning soapy products. I'm waiting for a few ingredients to show up so other products can be made. I've pampered myself and I've enjoyed the sunshine in a way that I can't when I'm at work. 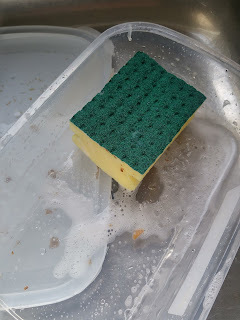 First, and foremost, soap has been made. 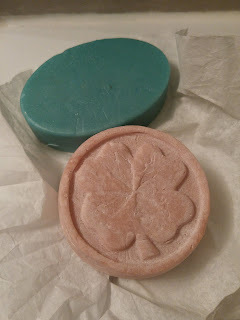 Granted, I've only made two batches this week but, first, the week isn't over yet, and second, I really don't need that much soap for now. What I'm making now won't be ready for sale for at least a month (one of them). I wasn't going to make it but the Poop emoji soap really did sell well last year. I sold out at the Christmas market and decided then that I wasn't going to make any more. 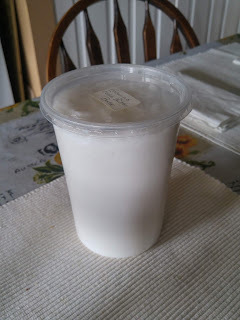 Now that market season is about to start, however, I decided that maybe I should make a batch or two of this year's markets. As I said, for some reason it always sells. I guess it's the snicker factor; everyone snickers when they see it. They're almost afraid to touch it but fascinated to find that it smells like Chocolate Fudge. It makes me giggle every time I watch people's reaction. I love these bar molds. 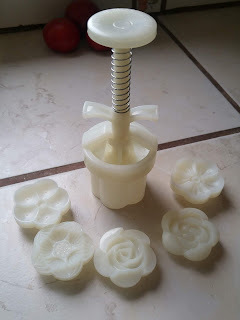 I used to make this soap in a variety of sizes and shapes, including flowers but I like these shapes better. They fit nicely in the hands. The bars come in at just under 3 oz, so they're a nice size and, this way, they look very similar. 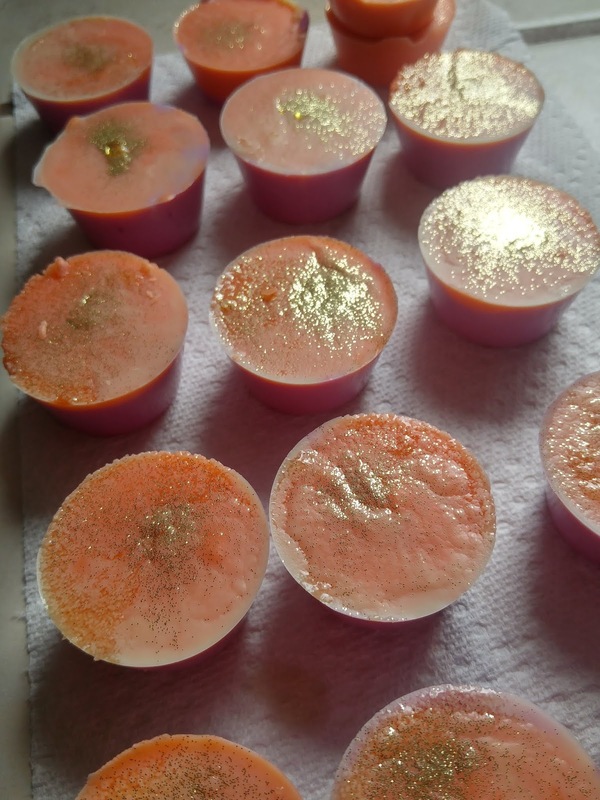 Yesterday, I made a batch of Fizzing Bath Melts, made with cocoa butter, citric acid, and baking soda. When added to your bath water, the cocoa butter melts, creating a skin-soothing bath. 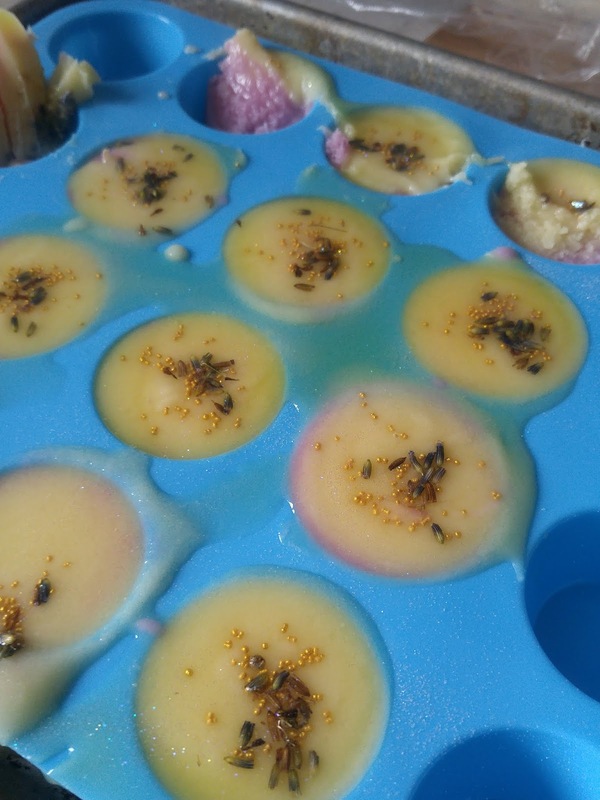 They're also made with fragrance oil, this time Lavender & Basil fragrance oil. 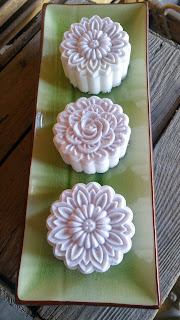 I love making these using a moon cake press; it's so easy and they're so pretty. This past weekend, I played with another product, something totally different. They look edible don't they? Like strawberry marshmallows, right? Well, appearances are deceiving in this case. These are Marshmallow Body Wash Cubes; yes, they're soap! They look like marshmallows, they feel like marshmallows. 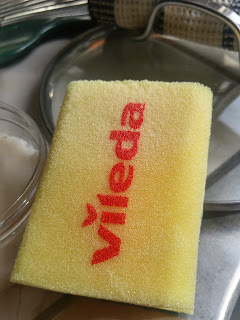 You use them to wash yourself. The recipe made a few more than I had anticipated. I'm thinking of bagging about four to a bag and adding a tag just to see how, or if, they will sell. They smell edible; they look edible. I'll definitely have to add a warning tag! Today's only Wednesday; I still have a few days off. In that time, I'll be shrink wrapping and labeling soap; I'll be making and packaging other products, including shampoo bars and conditioner bars. I'll also be making sure I take time to enjoy the beautiful spring weather we're having. I'm not sure I'll be ready to go back to work next Monday; I'm enjoying my time off far too much. Seriously, I love my baths. I don't love my bathtub but I love baths. When we first moved to Kelowna, the house we rented had an amazing tub in the master suite. 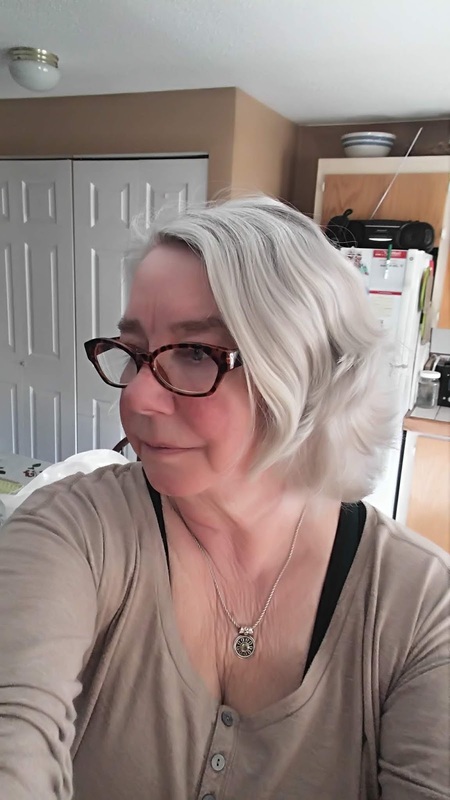 I couldn't even touch the end of the tub with my toes without almost submerging myself and, when filled, the water came all the way up to my chin. I still miss that tub. One of the things I enjoy about bath time is the number of things that make it so relaxing. I like bubble baths but they're not my favourite. 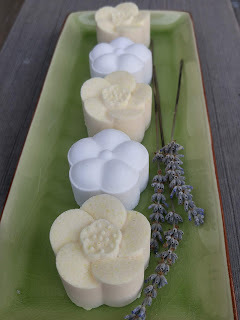 Bath melts, however, that's another thing. When you drop one into your bath water, they slowly start to fizz, releasing all that skin loving cocoa butter goodness and the fragrance. The addition of Polysorbate 80 helps to keep the oils in the water and not on the sides of your tub. And, when you're done, your skin feels so smooth and moisturized. 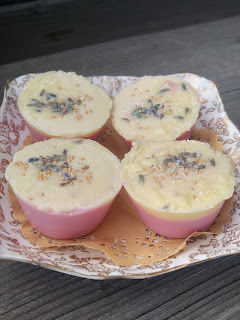 This past weekend, I made a batch of lavender bath melts. I overfilled the molds and ended up with a bit of an oily mess. I put them in the freezer and didn't realize that the lid of the freezer hit the mold. Big sigh! I was not very happy. However, once they solidified, they were okay. The three at the top are definitely only for me (which is just fine!). These are lavender scented, perfect for a night time bath. I sprinkled them with gold jojoba beads and a few lavender flowers. On Sunday, I made another batch and made sure not to overfill the molds. This time, I coloured them orange and purple and scented them with Karma, a Lush duplicate, one of my personal favourites. A dusting of gold glitter will be fun in the tub, I'm sure, but a bit of glitter never hurts, right? Now, if only I could get the landlord to install a REAL bathtub! I've had an entire week off and almost nothing has gone according to plan, not that that's a bad thing. I always try to take the second week of August off as my way of celebrating my birthday. In the past, we've taken that week as our road trip week; that didn't happen this year. It ended up being ME time. I was pampered and spoiled and have done pretty much whatever I've wanted. And now, it's Friday. 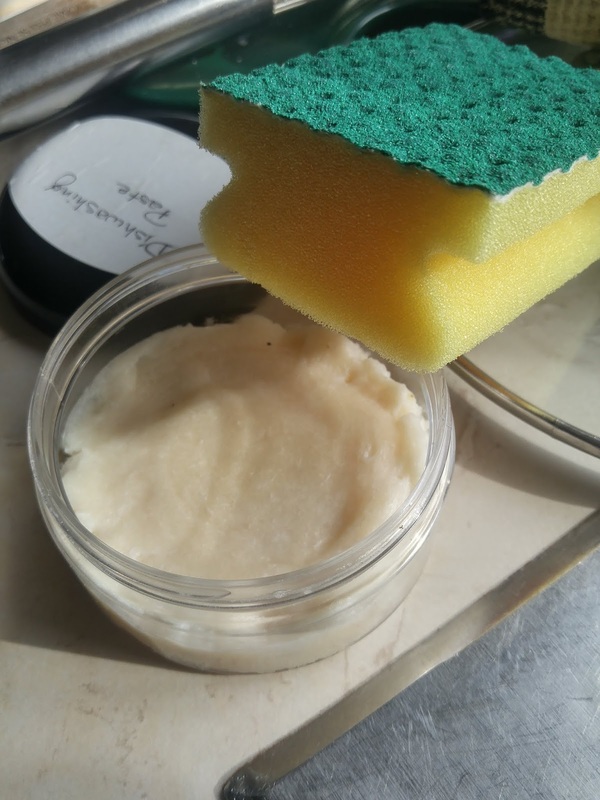 I did make one batch of soap this week and, in reading through recent blog posts, managed to copy a scent combination I've already done. The combination of Green Tea fragrance oil and Lemongrass essential oil has, apparently, become a favourite. 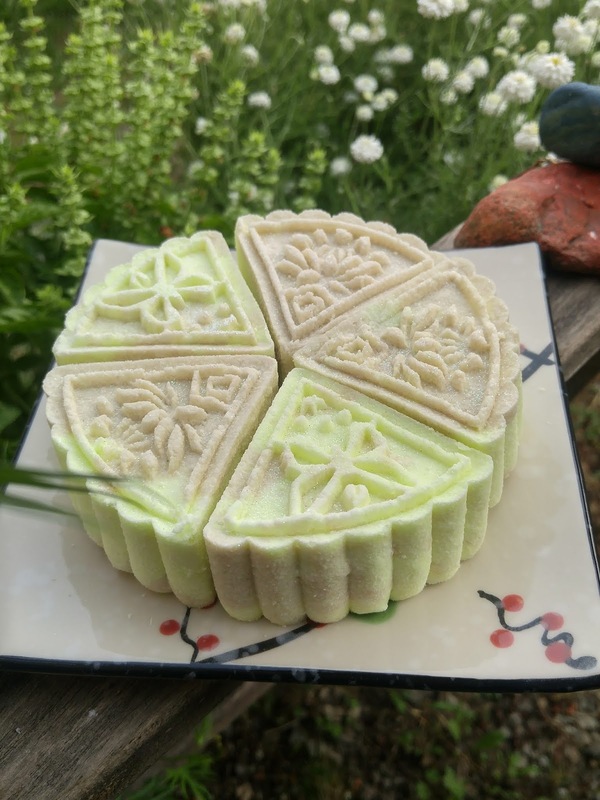 I love the freshness of the lemongrass in combination with the lightness of the Green Tea. 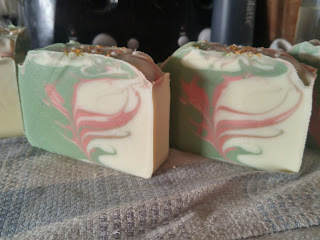 The swirl is a hanger swirl and almost a Secret Swirl; the white and the green were poured at the same time; when the mold was about half full, I poured the pink down the center, then continued in the same manner. I'm very happy with how it turned out! If I can manage to create a true Christmas Green and a Christmas Red, I might try something like this as a "Christmas-y" soap. 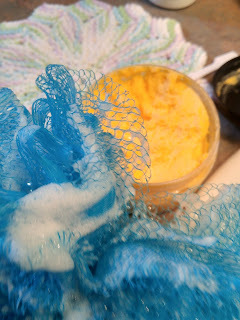 Years ago, I used to really enjoy making my own bath products. Honestly, I still do. 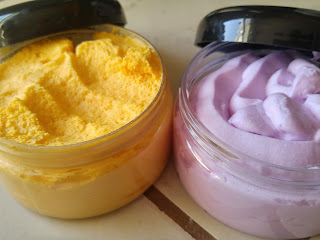 Wanting some diversity on my market table, I'm slowly getting back to making bath products. I've been told that bath bombs haven't really been a big seller at the market but I'm willing to give it a try. 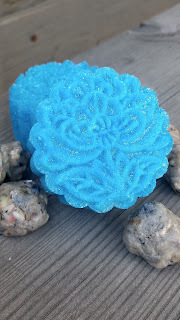 I've been using Moon Cake presses to make some really pretty bath items. Keeping with the theme of "lemongrass", these are scented, again, with Green Tea and Lemongrass. They also include a packet of Matcha green tea powder. 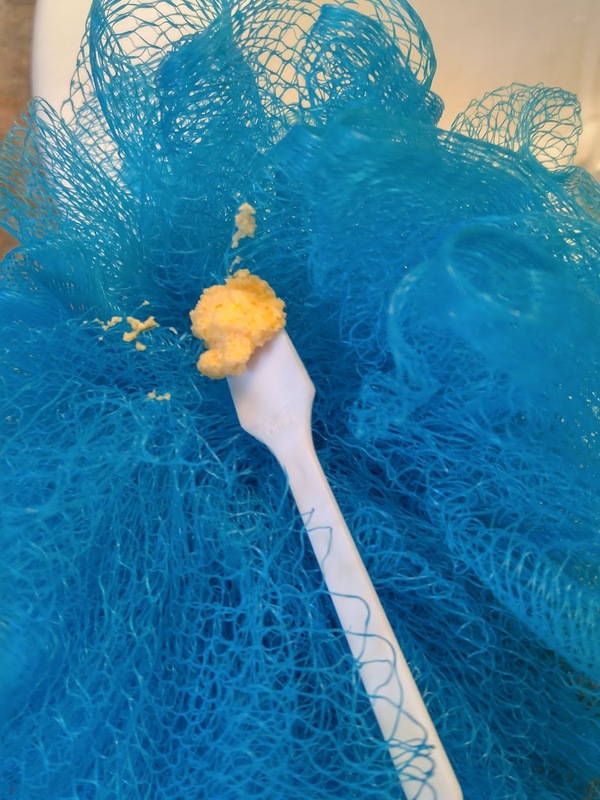 Bath bombs can be challenging. 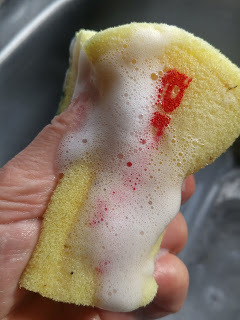 If they have too much moisture, they'll start to fizz and you'll be left with a mess. If they're too dry, details from the press will be lost. There's a fine line and finding it isn't always easy... or successful. This batch was a touch on the moist side and I was afraid they'd activate. Thankfully, they puffed up a bit but stabilized quickly. Each "bomb" is about 50 grams. They fizz but not as explosively as some do. It's more of a slow, satisfying fizzing. 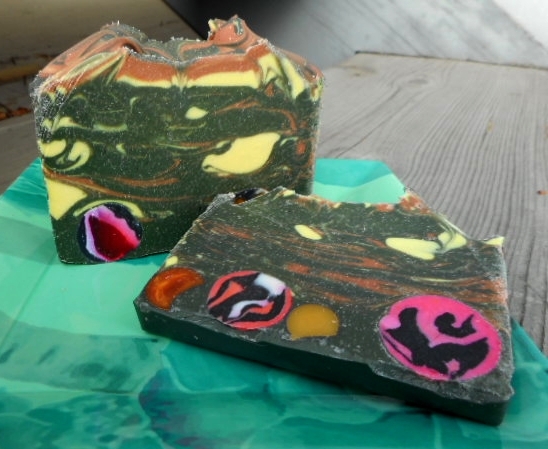 Next time I make these, I'll use more colour, in layers, to see how the colour plays out in the tub. Playing with the moon cake presses really is fun. Each press comes with 4-5 plates and you can swap them out at any point. 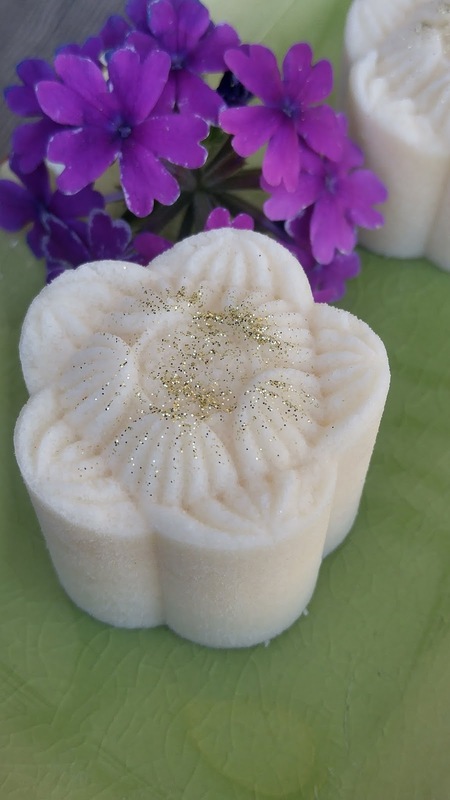 They're great for bath products like Shower Steamers, Bath Bombs, Foaming Bath Melts, lotion bars... all kinds of things. 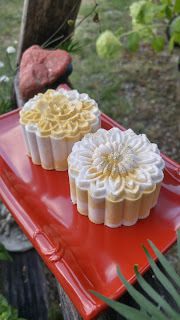 The shower steamers have already proven quite popular at the market. There are those rare times when everything falls into place, just as you'd hoped and planned. It doesn't always happen but when it does, it's exciting. For me, it happened yesterday. 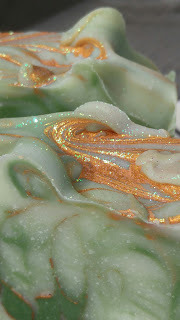 The Green Tea fragrance oil is such a lovely, gentle scent that I thought would work well with Lemongrass essential oil. Once I decided on my combination, I mulled over the design in my mind. It had to be green. And white. With an accent colour of some sort. Then, I knew just what I wanted to do... a pencil line swirl. I could see it in my mind's eye. 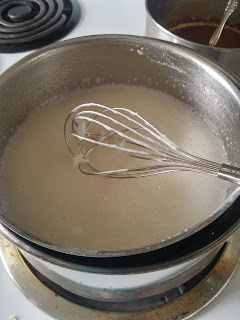 The recipe, a low coconut recipe, came together beautifully; I had just the right texture to do all the swirling I wanted. For my pencil line, I used Aztec Gold mica, an almost coppery-looking mica that perfectly accentuated the green in the batter. 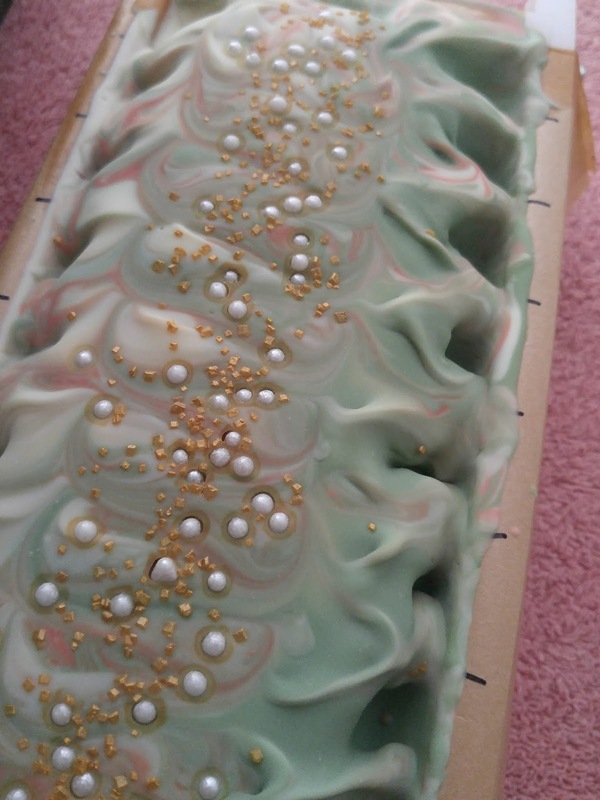 I am so pleased with this soap. I love the scent. I love the colour, I love the swirl. I love the mica lines. Of all the soaps I've made, this one is way up there on my fave list.